Mitch Rutledge is someone who started out life with the cards stacked against him. Born to a 13-year-old mother and never knowing his father, he never really had a family to be a part of. His mother was in and out of his life, so he and his 3 siblings were passed among family members, only to be briefly reunited when his mother showed back up. Eventually, his path led to prison. 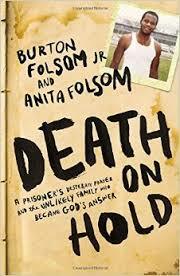 Death on Hold tells the story of how he ended up in prison, and eventually began a correspondence with Burton Folsom which would change both of their lives. Mitch Rutledge had several opportunities to turn his life around before he ended up in prison, but he was always held back by one obstacle: illiteracy. The shame of being unable to read or fill out a job application led him to a life on the streets. After his mother died when he was only 15, he was well and truly on his own. Before long, he ended up in prison, after an attorney convinced him to plead guilty to a burglary he didn't commit (although he rationalized that there were plenty of crimes he had gotten away with up to that point, so maybe things were just being evened out!). This put him into the criminal justice system, where he learned to adapt to the system. He talks of being jealous of other inmates who had family members to visit them in prison and to care about their welfare. Eventually, when he was released from prison, he continued his life on the streets and ended up killing someone during a robbery. Luckily for him, a lawyer associated with the Southern Poverty Law Center defended him during his trial for murder. The new lawyer taught him how to speak and behave in front of the jury, something Rutledge had never before considered. Even so, he was convicted and sentenced to death row. While on death row, Time magazine sent a reporter to interview inmates, and he was featured in a story that caught the attention of Burt and Anita Folsom. The article painted a grim picture of several death row inmates, with Rutledge being described as having an IQ of 84, defective and concluded, "His death would not be unbearably sad." Both Burton and Anita Folsom read the article and were incensed at how Rutledge had been portrayed. Both were teachers and both were unable to forget the friendless man sitting on death row in Alabama. Burton Folsom reached out by writing a letter to Rutledge, and the two became friends. As well as the Folsoms, several other people were moved by the Time article and also began regularly writing Rutledge. This small group became his family, and even testified on his behalf when he attempted to get his death sentence commuted. Eventually, Mitch's sentence was commuted to life without parole and then he moved into the general prison population at Holman Prison. His story continues as he discusses the problems he faced adjusting to life in prison, even as he taught himself to read and write and went on to earn his GED and take college courses. This book is mostly from Mitch's perspective, taken from letters he's written to the Folsoms over the years. It is fascinating to read about all he was able to accomplish behind bars, from speaking to at-risk youth groups, to tutoring and mentoring his fellow inmates. Overall, this is an inspirational story about a man who was able to see the terrible wrongs he had committed in his youth and to become a useful member of society, even from behind bars.